All nominations can be submitted through the Contact Form. A nomination may include support documentation including third-party testimonials, recommendations from public figures, newspaper or web-based news reports, and annual reports of other materials documenting the work of the nominee. The nominations will be submitted to the Foundation's Panel of Experts which will review and recommend award recipients for each category to the Foundation's Award Panel. Nominators must have direct knowledge of the nominee's work and should provide a number of specific examples, explaining how the nominee's accomplishments align with the award criteria. Letters of support may come from individuals or organisations with a direct knowledge or a basic understanding of the nominee's work. A nomination may include support documentation including third-party testimonials, recommendations from public figures, newspaper or web-based news reports, and reports of other materials documenting the work of the nominee. Nominee's work and accomplishments with details and examples that illustrate several of the criteria specified for the award. Nominee's background and details covering date of birth, country of origin and education. Support letters may accompany the submission. A photograph of the nominee – minimum 300 dpi resolution – as well as other photographs of the nominee at work may also be submitted. To receive the award, individuals selected must attend the award ceremony and also participate in media events and other events connected with the Mahathir Award for Global Peace arranged during that period. 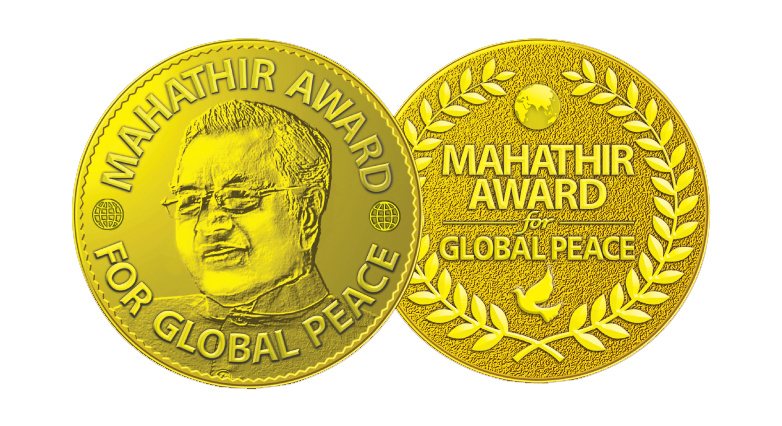 The expenses of award recipients attending the ceremony will be borne by the Mahathir Global Peace Foundation.